The TP Mechanical “Celebration Weekend” is centered on recognition of our employees for their continuous development, hard work, and servant leadership. The annual banquet is hosted on Friday evening at Great Wolf Lodge. During the evening we celebrate the apprentice, instructors, and milestone anniversaries with the company. Every year we feature a guest speaker who discusses the importance of servant leadership and team work. 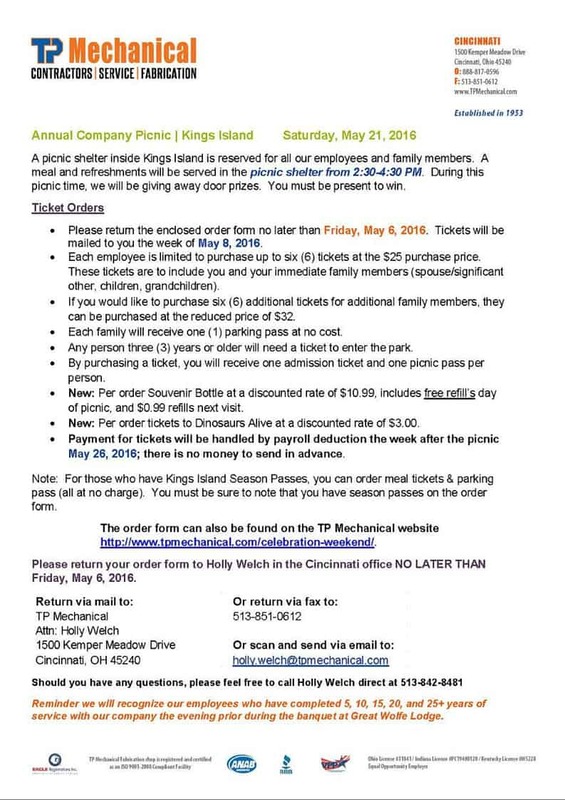 The annual company picnic is hosted on Saturday at Kings Island. During the picnic we distribute door prizes, safety awards, and the grand prize (a week’s vacation using the company timeshare). The picnic is a great time for the employees and families from different regions to meet face-to-face and enjoy a day with family and friends. Discounted room rates for the weekend to Great Wolf Lodge. Free childcare on Friday evening during the event. All forms should be returned to Holly Welch by email, fax, or mail.